National rounds of the 2019 Philip C. Jessup International Law Moot Court Competition are underway around the world. We wish the best of luck to all of the competitors and extend special thanks to the oral round judges, memorial judges, law student bailiffs, and other volunteers who make this global competition possible. And we don't mind asking Jessup alumni to visit www.ilsa.org and donate a couple of (hundred?) 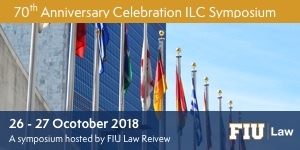 dollars to the International Law Students Association, which organizes the competition. They need and deserve our support.